If you’re raising livestock, you probably know already that some have a bad habit of venturing outside of the areas you intend for them to remain when you’re not around. Ordinary fencing might not be enough to keep them in a perimeter that you’ve set up. And there are also threats from the outside. Animal owners around the world have encountered problems with predatory wildlife damaging and hurting livestock. 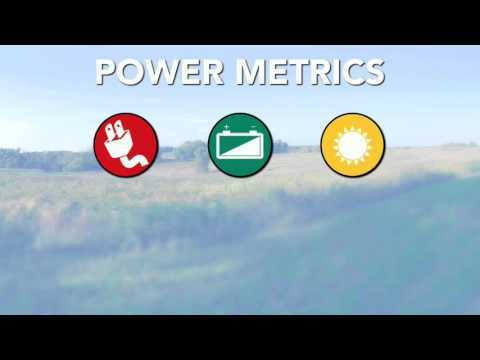 Sometimes, the only option is to use electricity to gain back control of your yard, farm, or pasture. Electric fence chargers are designed to keep animals both in and out of any place you intend for them to remain. Listed below are seven of the best chargers around, all of which were chosen for being durable and long lasting under most conditions. Don’t forget to read up on the Buyer’s Guide for more detailed knowledge that can narrow down your final decision on the best product for you. 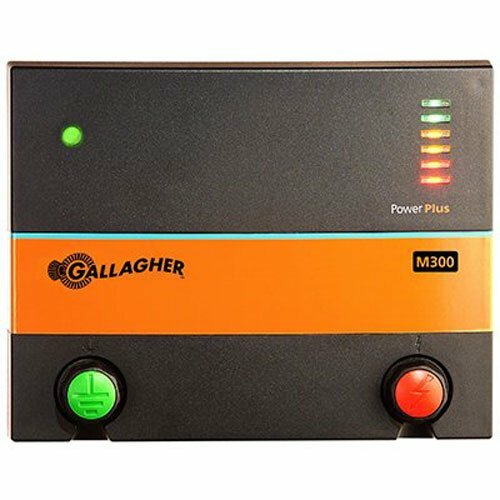 What is the Best Electric Fence Chargers to Buy in 2019? Due to the varieties in distance covered and power outputted to each product, you’re probably going to find yourself comparing the brands with each other. Here is a comparison list that shows the main specs on every device that’s reviewed further down. 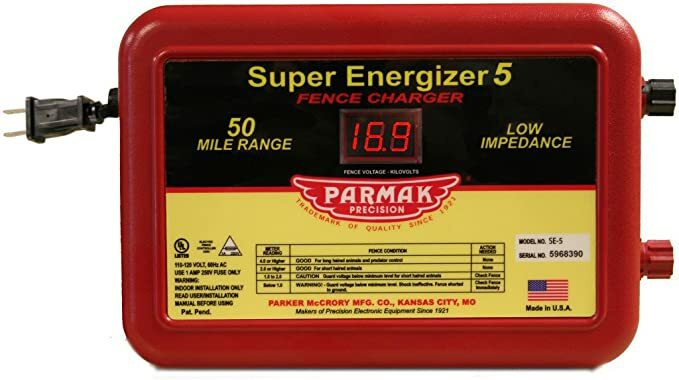 The Parmak Brand makes several high-quality chargers for fences. The company is known for producing some of the greatest in terms of power output and options. 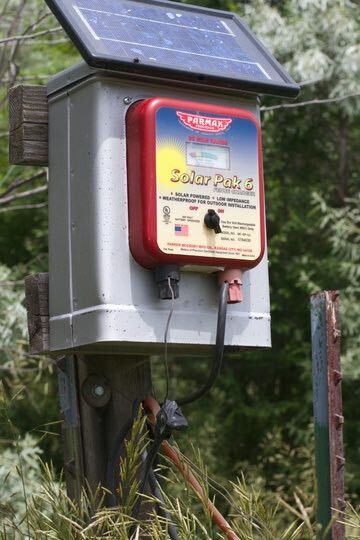 The Solar-Pak 12 is unique in that it offers two ways in which power is fed to wiring. There’s solar power, as suggested in the name. This will generate power to a battery that’s placed inside the device, which is a big way to lower energy costs. And then there’s the standard AC power which switches up controls as day and night changes. It’s very efficient and will retain enough power to be used for a long time without depending on the sun on a daily basis for energy. This device is also waterproof. It won’t succumb to damage if you list in a place that receives higher than average rainfall. But that doesn’t mean that you should keep it out when there’s risk of the charge getting saturated to the core. The device could lose power if this happens. And there could also be problems with loose screws in the interior. This is not an issue that’s shown with every charger, however. But if you do notice something rattling around in the inside, you may need to open it up to ensure that everything is properly tightened. 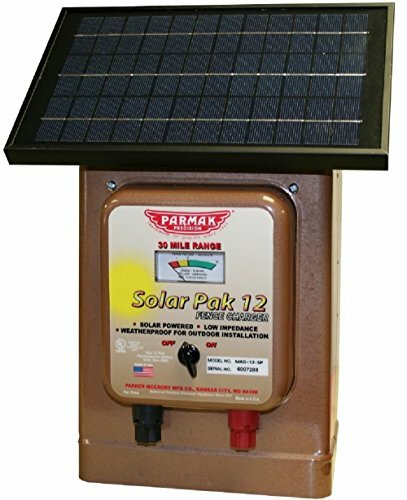 Still, the Magnum Solar-Pak 12 leads as the best option available to anyone in need of a good charger to secure their livestock. 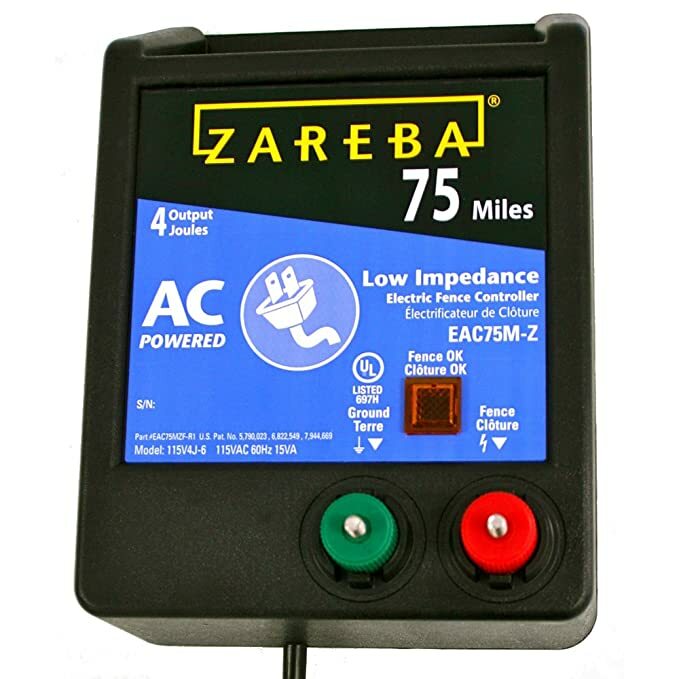 The Zareba EAC75M-Z is a powerhouse, and that’s saying a lot. Take the distance for an example, with its coverage extending well past 50 miles (75 miles in the maximum). Anyone that needs a charger that will cover lots of acreage and function well in moderately dense shrubbery is in luck. It’s also adaptable to most wired fences, so there’s a good chance you are already carrying something that will act as a good conductor when you begin setting it around your perimeter. While it isn’t weatherproof, you shouldn’t have any issue when it’s placed indoors or around a protective covering. And since this operates at pulse intervals, energy consumption will be small. Try out the brand if your property is large and requires good Joule output with every mile you want to electricity to cover on your fence. The second Parmak on the list is the Energizer 5, another low impedance charger that’s very easy to set up and runs quickly. You can get up to 50 miles of coverage here, along with easy setup that has color-coded wiring. Longevity is key here, and the build quality will make the product run for years after anticipated. While you might need to change the fuse (as with most chargers) overtime, everything else should remain easy for you to upkeep. But proceed with caution if you’re plugging it into a GFCI circuit. Doing so could trip the device whenever something touches the wiring. If this happens, you might end up damaging the outlet. But in any case, the Energizer 5 should run smoothly under most conditions. Find a proper fence charger for property that’s small isn’t always easy to do. Most of the device covered so far are best for those who need to ground long distances. The Gallagher G380504 M300 is the ideal product for pastures that aren’t big but sizable enough to require some sort of protection from predatory animals. And even if yours has lots of weeds, nothing should inhibit its ability to guard the area. Anything that comes into contact with the fence will receive a good jolt, no matter how dry the area could be. Dry climates have a tendency to lessen the amount of shock given, but this product appears to have no change in effect. As such, it’s recommended for dry climates as well. Just remember to perform upkeep on the panel so nothing takes on damages; it’s pretty fragile but should last a while after it’s acquired. 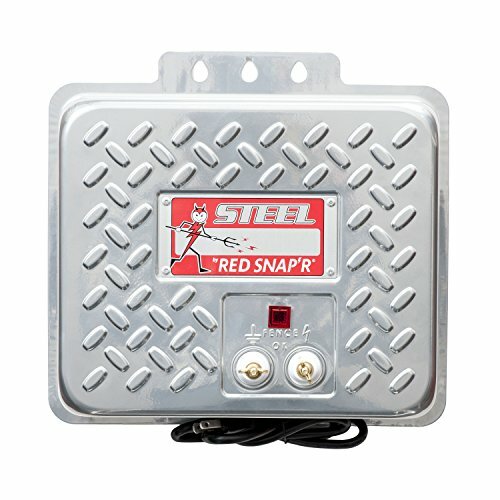 The Zareba Red Snap’r looks very tough with its steel covering. It’s solid and strong enough to keep debris out of the components inside. It’s also great for fences that cut through wooded areas. You could use it to prevent large or small animals from entering your property. But don’t be alerted by its loudness. It produces a loud ticking noise when turned on, so if you think the sound will become annoying, you might want to look elsewhere. It’s audible enough to be heard from a good distance. Regardless, it does keep ground and will halt any trespassing animals that live near your home. Good for people that live in rural areas with lots of random animals of varying sizes. 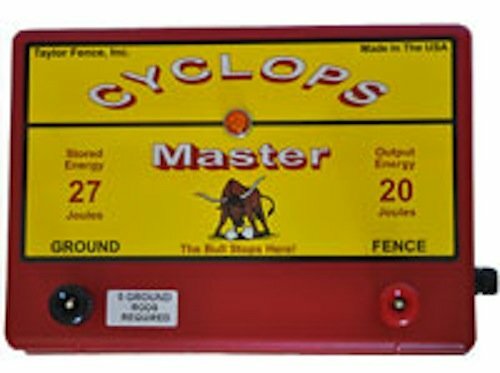 The Cyclops Master is an American made charger that’s strong enough to cover up to 640 acres of land. That translates into about 20 miles of fence distance. The best part of the machine is that stalls won’t occur easily. GFCI outlets are an exception to this. You definitely won’t want to plug one into this machine. It will trip quickly after being plugged in. It’s best to use if you own smaller animals or have a garden in your backyard that you need to secure from raccoons, opossums, or squirrels. The pulse may also be inconsistent, so this product would be best for anyone that doesn’t plan on securing larger animals such as bulls or horses. 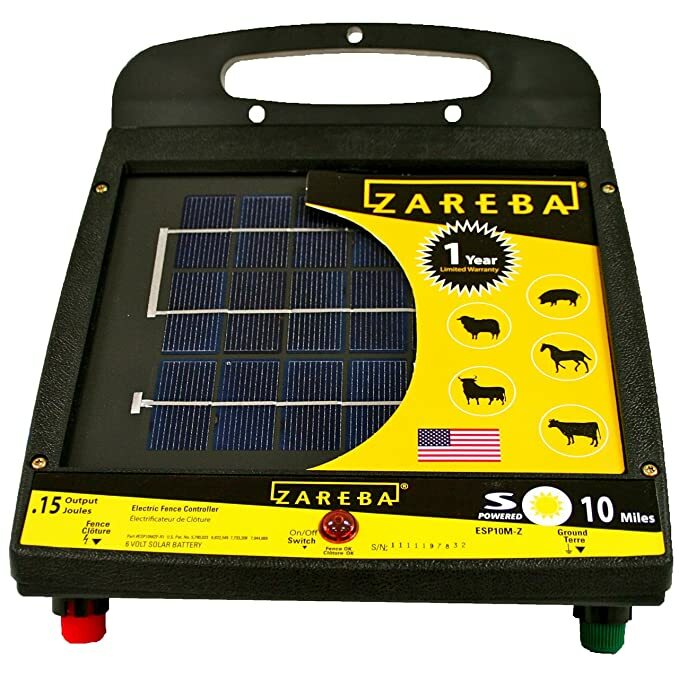 The final charger is the Zareba ESP10M-Z, a device that runs solely on solar power. If you wish to use an AC outlet, you will have to buy a separate adapter to get it running without a dependence on power from the sun. In any case, you should get weeks of power in the off chance that weather obstructs the sun’s view for some time. The range could be better but should suffice for most people with small to moderate-sized farms. For only ten miles, it does offer decent power. Weeds may affect this somewhat, so you may not get adequate protection if your fence goes in areas that contain tall grass. If you’re in need of a charger for your fence, you may already know a thing or two about how they work. But in the off chance that you don’t, here are a few tips to keep in mind before settling on one product. It’s a general list of things you should look for but remember to make your personal preference a priority over everything else. This is probably the most important factor to remember. Getting a charger that’s unable to go the length of distance you wish will make the pointless to use. As such, when you view a charger, check to see how far the range is. Furthermore, don’t forget to note the Joule output that’s possible with each mile. This will determine the level of power that’s possible in the distance you want. If you have a small farm, chargers with less power won’t need long range and will usually average at about 10 miles. But if you do plan to cover more than this, always go for the products that can reach at least 20 or more and not lose ground. Electric fence chargers are usually powered in three ways, either solar power, standard AC, or both. Battery power is also possible and most brands will list the feature of the listing when it is available. However, some are strictly operated on solar power and nothing else. Under this condition, you would have to buy an external adapter if you wanted to use AC power. But most of the products that do rely on solar power aren’t your typical devices that will lose function quickly; most of those that have the feature will keep your fence electrified for several days or even weeks without needing sunlight. Still, if you do live in an area that’s prone to receiving lots of inclement weather, your best choice would be to stick to a charger than at least has all three options for you to secure and protect your animals from predators. Most of the chargers of the list will need to be operated indoors. A few can go outside, but the safest bet is to give it some protection no matter what. A housing will work, such as those you see placed around breaker boxes. You don’t want the inside components to get wet, even if the products says it’s waterproof. For those that can be used in an outdoor setting, you may still need to cover it just to avoid general corrosion of its sensitive parts. Depending on your nearest outlets, doing this might not suffice for your fence. If so, you could always look into solar-powered chargers, as shown in the section above. A GFCI outlet is used to help keep yourself and anything else around at less risk of becoming shocked. You’ll find them commonly placed among outlets in bathrooms and outdoor areas such as garages and porches. Some people prefer to use these outlets for their fence chargers because they lessen the vulnerability of shock when the ground is wet and/or faulty. Yet, under certain conditions, this isn’t always a good idea. Some chargers will malfunction when this happens, requiring that the user replace the outlet with another GFCI. This tends to happen whenever an animal touches the wire you’re using, so unless you’re confident in making repairs to your fence charger, you may want to stick with an ordinary outlet that’s protected from water and moisture. This is why it’s best to stick to an indoor plug if you’re running a device with AC power. Most chargers for fences will run off pulse, which sets the voltage running through the wires at intervals. This means that electricity will not run constantly, and will have breaks in between. Most of the intervals are very short, averaging around one-to-two seconds. Some can be longer depending on the model and whether or not the user can change the timing. Pulse controls are recommended over constant power since it will allow you to save money on electricity bills. Energy efficiency is always suggested, and most of the chargers shown in the reviews implement pulse as a selling point in their functionality. Electric fence chargers can be used for lots of different purposes. You may have farm animals that have a habit of trespassing their intended boundaries and wish to keep them from venturing too far past a perimeter. Or maybe you have predators such as bears or raccoons that are threatening your smaller livestock. And there’s garden use, whereby deer and other large and small creatures have torn apart important plants or vegetables that you’re attempting to produce. Whatever the case, using a charger will surely put you back in control of your property. The animals will feel the sting but won’t become permanently injured from the wiring. But also know what you’re doing; you don’t want to accidentally shock yourself. Always follow the directions of the brand’s instructions when setting everything up. Use the proper fencing and wire, taking care to note whether or not weeds and grasses will affect the electric output going to the rods you have placed around the perimeter. On some chargers, too much brush will block the wire from reaching across a long distance. Others and specifically built to hold power in the densest canopy of wilderness. By now, you should hopefully have a decision on what kind of fence charger you’re looking for, and the distance and area it will cover to protect your animals. But in the off chance that you haven’t made up your mind yet, the Parmak Magnum Solar-Pak and Zareba EAC75M-Z are recommended above all the others. They both have excellent longevity and good power options, along with the added bonus of being easy to set up and use in wet or dry conditions. But don’t forget about the others also. They are great as well, particularly if your property is very large or small. Overall, all of the chargers will do the same thing, which is to keep your animals and plants from the protection of predators and respectful of your perimeter you have set for them! Hi! My name is Gareth. 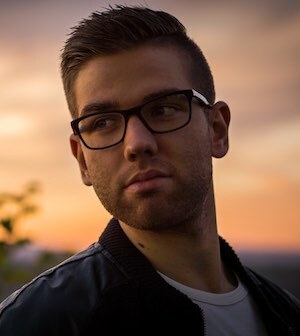 A tech geek, who indulge my readers with clear, well-researched, up-to-date, and simple articles that express my opinion about various gadgets. Some posts may contain affiliate links. GeekLah.com is a participant in the Amazon Services LLC Associates Program, an affiliate advertising program designed to provide a means for sites to earn advertising fees by advertising and linking to Amazon.com.